A mighty sorcerer whose power is second to none. His name alone commands respect and awe. He taught the King all he knows about magic. Sora, Goofy, and Donald arrived at the Mysterious Tower where the young Keyblade wielder met the Master for the first time. He shared some of his wisdom with Sora to prepare him for the more difficult journey that awaited him. After receiving his new clothes, Yen Sid also returned their gummi ship. After the fairies warned him of Maleficent's return, all of them disappeared and could not be found when the group returned to the Tower later in their journey. 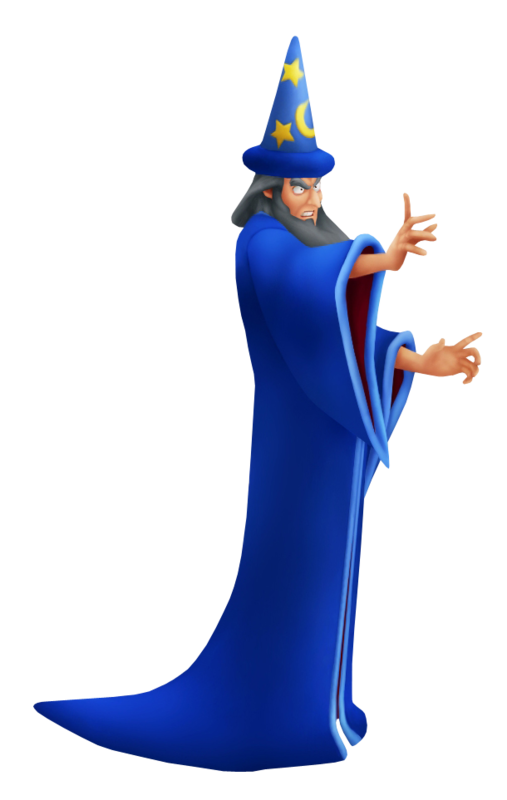 A wise and powerful sorcerer who taught Mickey all he knew about the Keyblade and magic. He is himself a former Keyblade Master, but still monitors closely the balance between Light and Darkness. The day before Aqua and Terra's Mark of Mastery exam, Yen Sid confides in his apprentice - King Mickey - that he feels a dreadful occurence will transpire. After the completion of the exam the following morning, Yen sid contacts Master Eraqus and informs him of the Unversed threat. Soon after, Terra visits Yen Sid's Mysterious Tower, seeking the wise man's guidance about the Unversed, Vanitas and Master Xehanort, who suggests they may all be part of the same problem. As Terra leaves, he quietly comments to himself "I had hoped, Xehanort, that your heart would no longer lead you astray." When Ven returns with the King's Star Shard, Yen Sid divines Mickey's location, offering a brief vision into his current situation, the severity of which sees Ven quickly departing to assist. Later, Aqua returns Mickey to the castle, soon learning of Master Eraqus' destruction at the hands of Terra and Master Xehanort. After Aqua's departure, Mickey is able to recover and also heads for the Keyblade Graveyard to assist Aqua and her friends. Following the defeat of Vanitas, Mickey returns to the Mysterious Tower with Aqua and an comatose Ven in tow. Yen Sid tries but is unable to sense Ven's heart, encouraging Aqua to believe in the strength of their friendship, which would serve to return him fully one day. Later, a sorrowful Mickey, feeling he has failed his mission, his friends and his master, returns the Star Shard and Keyblade to Yen Sid. As Mickey is about to depart, Yen Sid returns the Keyblade to him, confirming that Mickey had, in fact, passed his own test and become a Master. A former Keyblade Master and King Mickey's teacher now retired, Yen Sid oversees the worlds from a distance, keeping watch on the events unfolding in all corners. Upon a visit from his student informing him of the discoveries within the datascape, the two were able to deduce two out of three fates that had befallen the young Keyblade wielders of a decade past. All that leaves now is Terra. However, along with Terra is Master Xehanort. Yen Sid reveals that with the destruction of Xehanort's Heartless and Xemnas, he has been reborn and no doubt seek to continue his plans. In order to combat this threat, he makes the decision to summon Sora and Riku for their Mark of Mastery. A retired Keyblade Master and King Mickey's former teacher, Yen Sid watches over the Realm of Light and acts to ensure the balance between light and darkness is maintained. It was he who came to the decision that more Keyblade Masters are required in order to combat Xehanort, thereby calling Sora and Riku to the Mysterious Tower in order to put them through the Mark of Mastery exam to determine who would be worthy of the title. He holds a vast amount of wisdom, granting the two would-be Masters much-needed information regarding the nature of the Keyblade, as well as that of their greatest enemy, Master Xehanort. It was through Yen Sid that they learned of the Keyblade War, of the χ-blade, of Kingdom Hearts itself, and of the dangers that they will have to face. The Sleeping Worlds may be awaiting their return to the Realm of Light, but they will not welcome Sora and Riku with open arms. However, despite his fountain of knowledge, he could not foresee Xehanort's plans in action to the extent that it had been planned, and to his horror, realized that Sora and Riku had fallen right into his hands unknowingly. As the exam goes on, he struggles to maintain his senses and keep track of the two, but it is not without great difficulty that they eventually fall beyond his reach. With no options left, he resorts to sending Mickey to their aid as he places the now Keyblade-wielding Lea in the hands of Merlin and the Good Fairies, in the hopes that he'll be able to absorb enough experience to help them in their time of need. After the heroes return from their adventure in the Sleeping Worlds, he reveals that Riku's experience in the Sleeping Worlds through Sora's dreams granted him the ability to wake up a sleeping heart, and sends him back into Sora's dreams once again to wake the boy up from his slumber. As Riku returns unscathed, he proudly presents him the title of a true Keyblade Master. As expected of Yen Sid, he quickly dispatches Riku on his first task: to retrieve a special guest, and bring this individual to him. This special guest is in fact, Kairi, the seventh Princess of Heart. The former Master was aware that she could also wield a Keyblade, but what he has planned for her in regards to the dangers they face in the future is currently a secret to all but himself. The battle between the seven guardians of light and thirteen seekers of darkness will not be easy. A powerful magician and former Keyblade Master. He once trained alongside Masters Eraqus and Xehanort. He retreated to his Mysterious Tower after Eraqus' demise and Xehanort's betrayal. After naming Riku the new Keyblade Master from his Mark of Mastery exam, Yen Sid tasked the boy with bringing a special guest to his tower, the Princess of Heart Kairi. It is there that he allowed Mickey to speak of a forbidden story -- the story of Master Aqua. With this tale now told, he reveals the next step in his plan to stop Xehanort from his devious plan. Kairi, a new Keyblade Apprentice, will train with Lea under the supervision of Merlin while Mickey and Riku will go to the Realm of Darkness to save Aqua. He provides the two men with new clothes designed by the Three Good Fairies that will shield them from the darkness. With Sora's return from the Sleeping Worlds, he reveals to Sora, Donald, and Goofy that Sora is now weak, thanks to Xehanort's attempt to take over his body. He has faith the young Keyblade Wielder can regain his lost strength, and sends the three on a mission to do exactly that at Olympus Coliseum.